Glad to know that Dan keeps up on the NEC soccer standings, which are updated daily on NortheastConference.org. And he is right, the Knights (5-0-2) are alone in first, but Central Connecticut is only one point behind in the standings heading into the next-to-last weekend of the regular season. This former Mount player-turned-coach is obviously organizing a celebration to commemorate 40 years of women’s athletics at Mount St.Mary’s. We’ll have to keep tabs on her Twitter account for updates as February nears. NEC football fans have seen plenty of Nick Doscher throwing and running the football. It is also apparent that the former all-NEC quarterback can CATCH, too. Congratulations to Ike Azotam for doing some serious work on those Buffalo Wings. Cleaning up that plate like he cleans up the glass in NEC basketball games. 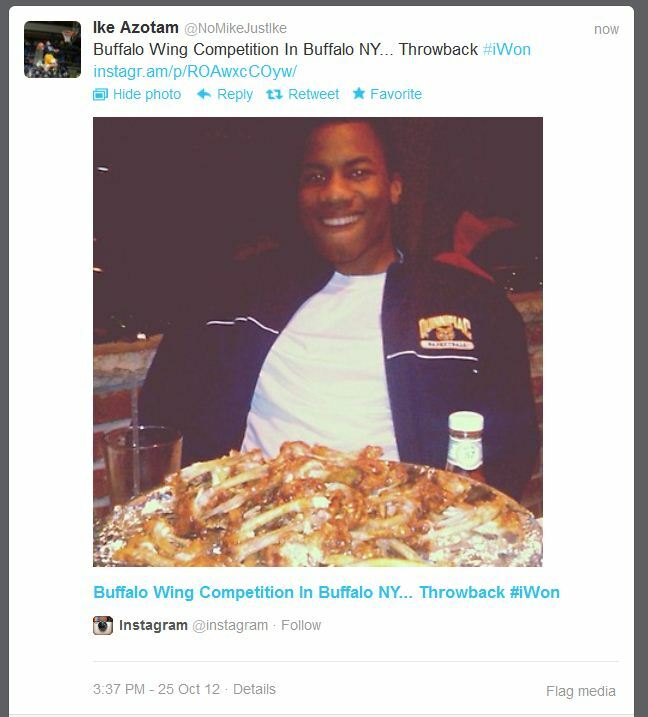 Is it possible for Ike and @NECralph to go toe-to-toe in a wing eating contest? We all know he can dunk as basketball, but here, Wagner’s Josh Thompson shows his philosophical side. Wagner’s good fortunes continued in Week 8 with the Seahawks posting a 31-24 road win over Saint Francis (PA). The team’s fourth consecutive Northeast Conference win means Albany, which was idle this past weekend, has some company in the title race. Although the Great Danes (4-1) are the lone remaining NEC unbeaten, the Seahawks (4-1) are only one-half game off that pace and will get a shot to go toe-to-toe with Albany on November 3. First, though, both Albany and Wagner will host Week 9 NEC matchups. With Wagner’s surge and Albany making good on its preseason favorite nod thus far, the two teams leading the race for the NEC title happen to be two of the winningest active coaches in all of Division I football. Wagner’s Walt Hameline has 209 wins to his credit, ranking him eighth amongst active FCS coaches. Meanwhile, Bob Ford IS THE winningest active coach in all of Division I (FBS & FCS). The “Architect of UAlbany Football” has 261 career victories. Oh, and don’t forget about Duquesne. Jerry Schmitt’s Dukes (3-1) were NEC co-champs last year and have rebounded from their first league loss by topping Sacred Heart at home. They face Albany and Wagner in Weeks 11 and 12, respectively. When we first saw his stat line, we thought it was a misprint, but the CCSU sports information department confirmed that what we were looking at was real. Hollomon compiled 377 yards of all-purpose running in Central Connecticut’s 37-31 setback at Robert Morris. The sophomore running back, who transferred to CCSU from FBS member Kent State, totaled 208 yards rushing, 56 yards receiving and another 113 yards on kick returns. 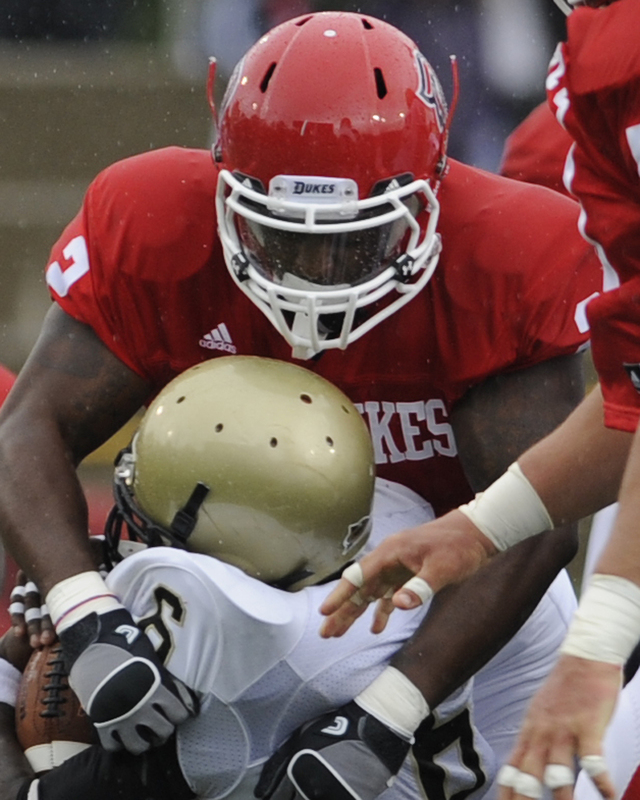 Hollomon’s 208-yard rushing day was the first in a NEC contest this season. His 96-yard kickoff return for a touchdown was one yard shy of the NEC’s longest ever. Oh, and that insane APY total is the highest in a NEC game since former Blue Devil Cory Harge went for 340 in 2004. With Bryant dropping the first six games of the 2012 schedule, the season did not start as Jordan Brown and Co. would have liked. Instead of packing it in, however, Brown and his teammates have done the opposite, playing some of their best football of late. Brown has his best day of the fall by running for 152 yards and two scores, including the game-winner, at Monmouth. He has eclipsed the 100-yard rushing mark in four of the last five games and his team has won two in a row. In addition to filling up the defensive stat sheet, the Duquesne linebacker spent much of the day making impact plays. Bell, who is earning an Overtime! Game Ball for the second time this season, played like a man possessed. He sacked the Sacred Heart quarterback FOUR TIMES, picked off a pass and forced a fumble. Had he not received a Game Ball for such a performance, it would be criminal. And she certainly picked a good one to make her first. 68 points scored and a win for Robert Morris. We are thinking she will be back at Joe Walton Stadium when the Colonials host Steel City rival Duquesne on November 3. 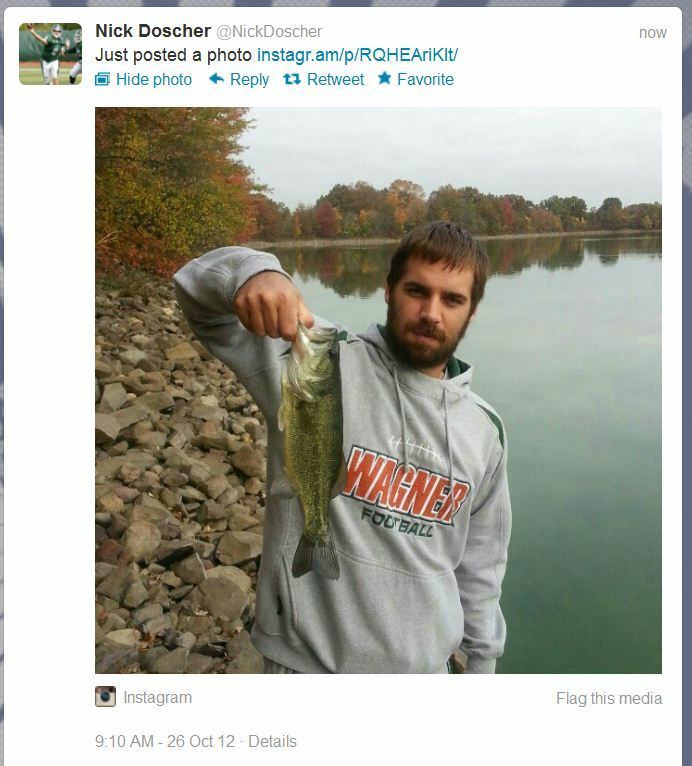 Wagner’s senior quarterback isn’t shy to rally his troops using Twitter. This alumnus feels like many of us do. Who doesn’t wish they could go back to their college years? Even on his bye week, this all-NEC receiver (Albany’s Ryan Kirchner) is studying the game of football and wondering What Would Ford Do? This Duquesne receiver is happy his team bounced back from a loss at Central Connecticut by treating the Rooney Field crowd to a win over Sacred Heart. At 3-1, the Dukes, last year’s co-champs, have their sights on another conference crown. Just another case of Wagner’s athletics communications staff making fans happy. Pivotal Matchup in Pittsburgh: Host Duquesne is looking to stay within arm’s length of first-place Albany, while visiting Monmouth is looking to stay alive. The Hawks were stunned at home by Bryant in Week 8 and are 2-2 in league play as a result. Never has a team even with three league losses even tied for the NEC crown. A lot of Line on Staten Island: Wagner will welcome Robert Morris to Hameline Field in hopes of notching the program’s first-ever five-game Northeast Conference win streak. More importantly, if the Seahawks can avoid tripping up in this one, they will have a chance to play for first place come Week 10. Harris’ Chase on Hold: With Bryant on its bye week, Jordan Harris’ climb up the Northeast Conference’s career receiving yards list is on hold. The 5-foot-11 Harris (2,270) moved into seventh place on the NEC all-time receiving yards list in Bryant’s win at Monmouth. He can move into sixth place by gaining 35 more yards. Already his program’s career record holder for receiving yards, he needs just one more receptions to become the Bulldogs’ all-time leader in that category. Overtime! Blog is counting down the remaining days until the ceremoniously tips off the 2012-13 basketball season with NEC “Social” Media Day on October 23 at the brand-new Barclay’s Center in Brooklyn. In an attempt to whet your appetite for the #NECinNYC event, we will be featuring a Tweet, Fact and Photo (related to NEC hoops) on a daily basis. #NECMBB: The often-read Jeff Goodman, who covers the national college basketball beat for CBSsports.com, sent out this complimentary tweet late last week. While working toward a Master’s, Bashir Mason will make his head coaching debut when Wagner visits Delaware State on November 14. #NECWBB: Robert Morris junior forward Artemis Spanou spent the past summer playing for her native Greece in the U20 European Championships. 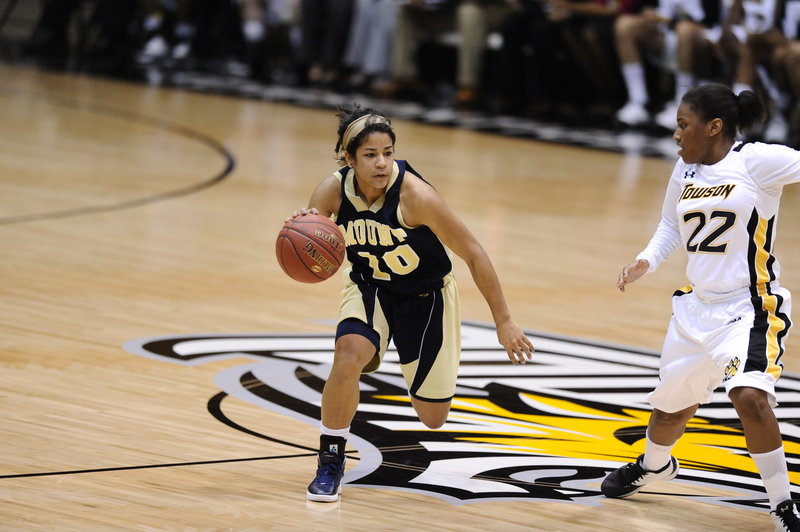 Just as she did during the 2011-12 NEC season, Spanou averaged a double-double over an eight-game span with the Team Greece. Her 20.4 points per game ranked second at the Championships, while her 12.6 rebounds per contest led all players. The performance earned Spanou the U20 European Championship Most Valuable Player award and helped Greece to a 7-1 tournament record. #NECMBB: Wagner photographer Dave Saffran captured this photo of Josh Thompson’s notorious dunk over his parents. Thompson one-upped his highlight reel dunk from last year, when he leapt over his mom for a jam, by adding his father to the equation this year. #NECWBB: We assume she’ll be watching when Sal Buscaglia joins Dave Popkin and Tim Capstraw live from the Barclay’s Center on Tuesday. You can view the festivities for free via NECfrontrow.com beginning at 11:00 am. #NECMBB: There have been six back-to-back NEC Tournament winners. Robert Morris has turned the trick three times (1982-83, 1989-90 and 2009-10), along with Marist (1986-87), Rider (1993-94) and most-recently LIU Brooklyn (2011-12). No program has ever won three in a row, but Jacki Perri’s Blackbirds can change that this season. #NECWBB: Mount’s Selina Mann ranked second amongst NEC steals leaders last year after finishing atop the league in that category as a sophomore. #NECMBB: LIU Brooklyn will play the first-ever college basketball game in Barclay’s Center history when it faces Morehead State on Friday, Nov. 9. The NEC will receive an up-close look at the new state-of-the-art facility well before then though. #NECWBB: Defending NEC champion Sacred Heart has never finished lower than a tie for third place in the league standings. The Pioneers have been league members since 1999. #NECMBB: Yes, that is Robert Morris head coach Andy Toole. 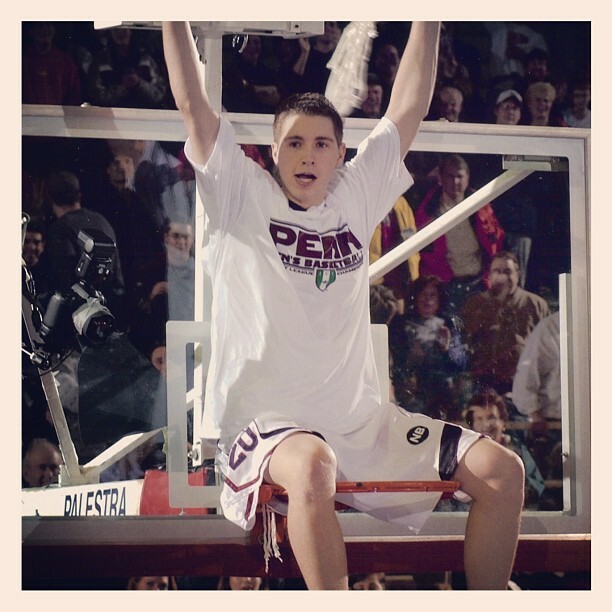 The Jersey Shore native led Penn to the Big Dance as a player about a decade ago. Now, can he lead the Colonials there in 2013?